This review previously appeared, in slightly different form, on the Henk of Holland website. Side opening cardboard box with 3-view painting guide on the backside (for one marking option). 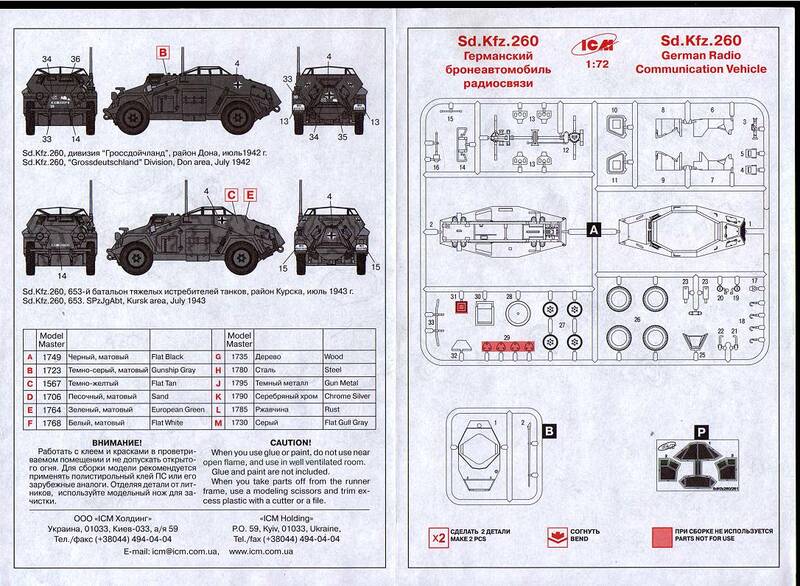 As this kit is based on the Sd.Kfz.222 from ICM, I refer to the review of that kit. Again, there is no interior provided, and given the scarce resources on this vehicle, you're basically on your own. The photo-etch part, on the other hand, is finely done, but the three-part assembly fits difficultly. The main difference with the 222 is the lack of turret, the new hull top and a nice rod antenna.
" 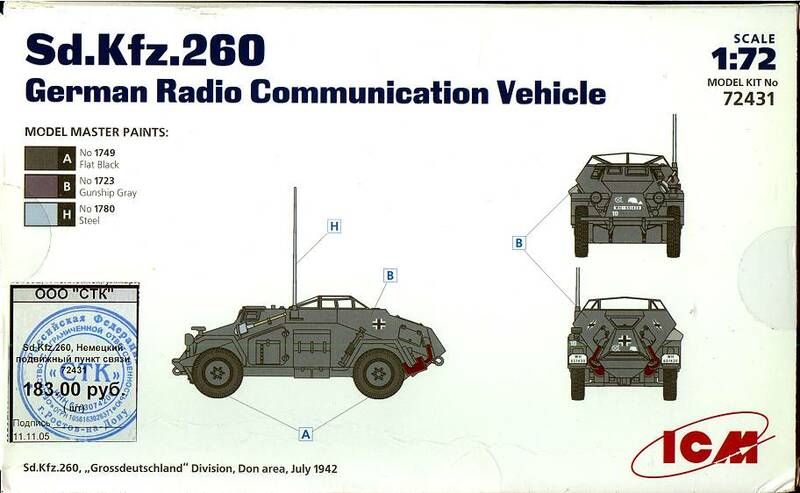 The main issue with this kit is that, according to my references, most Sd.Kfz.260s were based on the Sd.Kfz.221 hull (the 261 being based on the 222). Photographic evidence shows at least one Sd.Kfz.260 with the Sd.Kfz.222 hull. As there are many subtle and less subtle differences between the 221 and 222, there are basically only two choices: assume that this vehicle was not alone, or change the complete hull and be admired by many !" 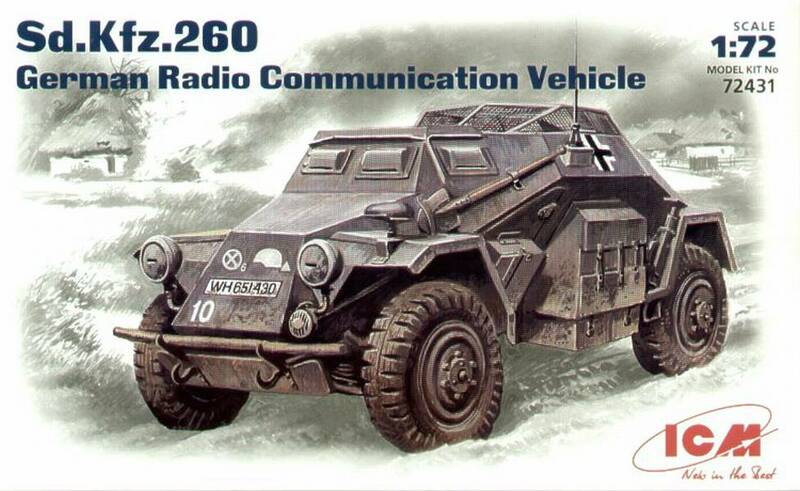 Well, we can now go for the "assume that this vehicle was not alone" option, as the recently released Tankograd book  on the Sd.Kfz.222 family shows that these hulls were not that rare as I originally assumed and the new Panzer Tracts book  even goes as far as stating that all Sd.Kfz.260s and 261s were based on the Sd.Kfz.222/223 chassis. I only discovered, years later, that the front fender bins are missing, while they can be vaguely seen on the boxtop. The instructions are in Russian (Ukrainian ?) and English. They are of the drawing type and are very clear. Five parts are not for use, and marked as such. 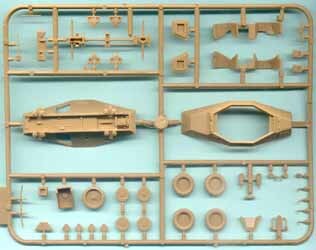 This kit assembles like a breeze, just like its sibling the Sd.Kfz.222. 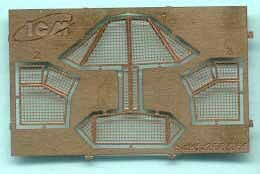 The only troublesome part is the cage mesh, which is difficult to bend in the right places and does not quite seem to fit the hull top. Unfortunately enough, in some kits (I have 6 of this kit and its variants) the SS licence plates are removed by the censor (which in one example was overly enthusiastic and damaged others). 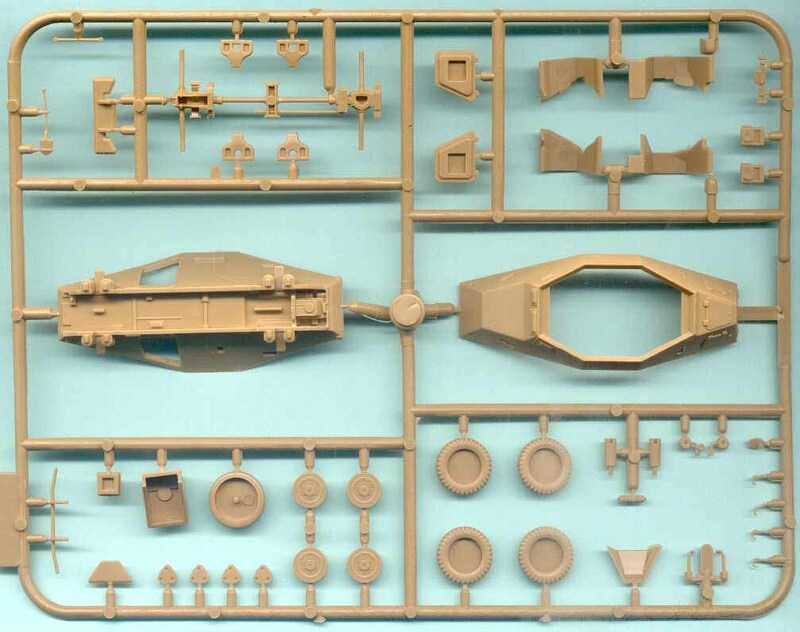 These are meant to represent vehicle SS163240 from LSSAH  in the SdKfz 261 kits. Grossdeutschland, Don Area, July 1942 in overall “Gunship Gray” (read RAL 7021 Dunkelgrau). 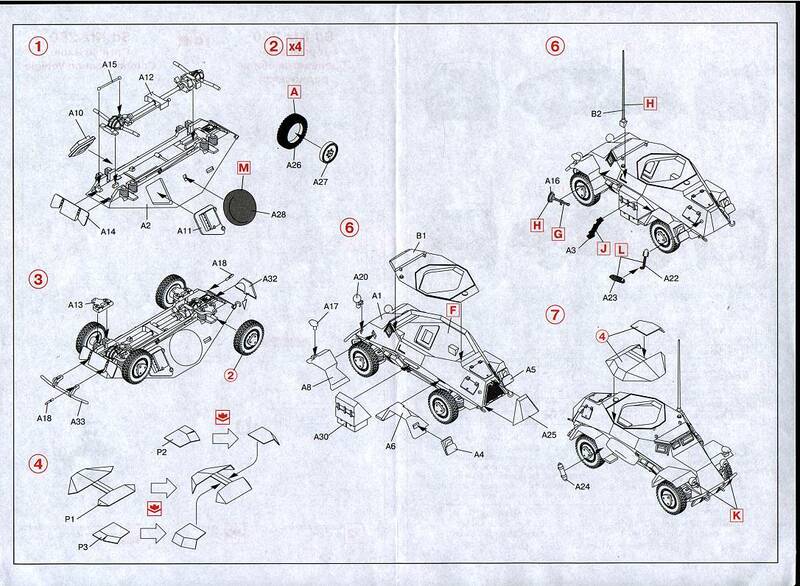 This vehicle is shown in 3-view on the backside of the box. Something peculiar is that the decals react with Revell Matt varnish (and probably also with other enamels). They actually dissolve to a paint-like substance, which means you will get no silvering and perfect adhesion, as the carrier film also dissolves. That is, if you take care. If you don't, you might VERY easily ruin the decal. I am a great fan of this kit. The best thing about it is the great ease of construction (apart from the mesh, which is quite difficult to assemble) and the retail price. It is also dimensionally accurate. The worst is the complete lack of interior. 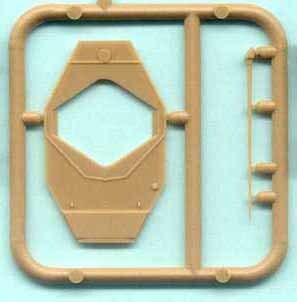 The detail is also not as crisp as on the MarS kit of the Sd.Kfz. 222 and 223. Model finished in markings of Grossdeutschland division with AB figures. 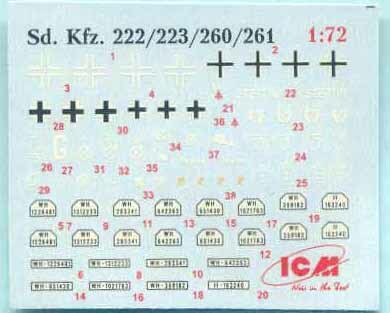 Also check Stephen Brezinski's previews of the ICM Sd.Kfz.223 and 261 and the article about the evolution of the Sd.Kfz.222 and its variants.